Case story (From the work experience) : A 6 years old boy brought to the ED in Emaba fever hospital refered from the university hospital as meningococcal meningitis , the child was febrile , drowsy , has dessminated dark violaceous skin rash associated with swollen eye lids , inflammed red both eyes , swollen lips and inflammed buccal mucosa with cracking and erosions . The CSF analysis revealed : cells 10/cmm , sugar : 76mg/dl , protein 18 mg/dl , no organism detected on gram stain No history of convulsion , Past history was unremarkable except for a distant history of tonsillectomy and adenoidectomy , the family history was not contributory (Q) Do you agree for such a diagnosis? The story started 5 days earlier by fever , sore throat dry cough and vomiting once , received empirical ceftriaxone from a private dispensary together with paracetamol as an antipyretic without adequate satisfactory response . On the fourth day a maculopapular rash appeared on the face , and trunk , then distributed to the abdomen palms ,soles and lower limbs the rash was burning but non itchy , the eyes ,lips and genitlia were involved . 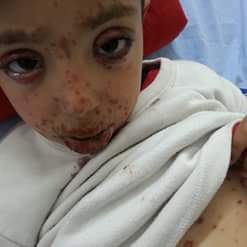 He was provisionally diagnosed as measles and isolated in our hospital ward for one day then discharged on the parents request to continue treatment and isolation at home . One day later the general condition deteriorated more , fever persisted and the rash became more disseminated and more dark , transferred to the university pediatric hospital where LP IS DONE . Physical examination showed a drowsy child , temperature : 38.5 C , O2 saturation : 97% on room air , pupils equal ,about 5mm , reacted briskly to light , pulse :120/m no lymphadenopathy , RR: 24/m , no jaundice , mouth examination: swollen lips with inflammed ulcerated buccal mucosa , with oral moniliasis Skin examination : revealed flat irregular purpuric macules with some blistering lesions some lesions have a cyanotic center surrounded by pink erythema neck lax with no signs of meningeal irritation , GCS: moderate 10/15 E1V4M5 , : Chest: harsh vesciular breathing , Heart : normal S1, S2 . Abdomen : soft , Joint examination : normal , Neurological examination : intact motor and sensory power and no cranial nerve affection . Investigations : CBC was normal apart from leukocytosis ( TLC , 13,500) , CRP was positive , ESR :40 Na :129meq/l , k: 3.4 urine examination normal, S.liver and renal profile was normal , Chest x-ray : normal , CT Brain examination : was normal . Discussion of the differential diagnosis : - The fever ,rash and altered mental status raises the possibility of meningococcal meningitis but the rash is characteristically petechial and purpuric reflectig accompaning systemic vasculitis the rash is sometimes similar to that of measles but cough and conjunctivitis are usually abscent , gram stain and culture failed to reveal evidence of meningococcal meningitis , however the short course of antibiotics prior to LP reduces the chance of isolation of bacteria in CSF culture making the diagnosis difficult ,and this is the importance for molecular methods (PCR) for rapid diagnosis of bacterial meningitis . The prodrome of upper respiratory symptoms , fever and painful skin together with the cuteanous and the mucosal lesions which invoved the lips , mouth , and conjunctiva , the iris or target lesion is a pathognomonic diagnosis for erythema multiform which was present early in this patient , the morbiliform rash observed initially was confusing with the measles viral exanthem , however there was no coryza or watery eyes which is present in measles prodroma , and the rash is sometimes itchy but not burning .Kawasaki disease is an acute febrile illness affecting infants and children characterized by bilateral conjunctival congestion , with dryness ,redness and fissuring of the lips also exanthematous rash localized to the trunk with redness of the palms and soles , with desquamation ,also increase CRP and leukocytosis it is excluded by absence of painful cervical lymphadenopathy , there was no arthralgia or arthritis absence of gastrointestinal or uretheral symptoms . and the liver enzymes were normal , The patient was managed as Steven Jhonson Syndrome , the offending drug stopped (ceftriaxone ) , the patient is isolated , I.V. fluids started , dermatologic , and ophthalmolgic consultation , antihistamines are given , skin and mouth care , topical soothing application , short course of coticosteroids ,antibiotics drops and ointments , systemic antibiotics to guard against secondary infection , follow up of the patient was excellent , the patient markedly improved , fever subsided and the rash disquamated over about one week .